Since 1955, Wilson Equipment has provided quality equipment, parts, and service to Nova Scotia’s road building, construction, forestry, and mining industries. Our current product lines include Komatsu, Dynapac (Atlas Copco) and GEHL in addition to our many complimentary lines of attachments and accessories. 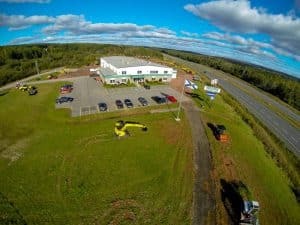 In April of 2013, Wilson Equipment was acquired by SanStone Investments, a group of Nova Scotian private equity investors, who are committed to growing the business through developing its people. In January of 2014, Wilson Equipment opened its second location in the Burnside Industrial Park in Dartmouth.